An impacting, day-by-day guide to make every step of pregnancy significant. From planning a pregnancy to delivery, you'll be captivated by God's heart for you and your baby. Featuring over 260 engaging and interactive prayers formatted with a daily topic, verse, devotional, and journal tip. This is a book every Christian mother should experience. You uniquely create a record of your thoughts, feelings, and prayers during this very spiritual and special time in your life. Learn to pray for and bond with your child even before birth. Get a "heads-up" on parenting. Grow spiritually in knowledge and wisdom. Be empowered by God for your biggest ministry yet ...motherhood! Sisters, aunts, grandmothers, birth mothers...even friends could adapt and use this book for someone they love. Expect great things! - Publisher This day-by-day guide for planning from pregnancy to delivery features more than 260 engaging and interactive prayers formatted with a daily topic, verse, devotional, and journal tip. 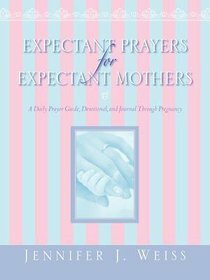 About "Expectant Prayers For Expectant Mothers"
This day-by-day guide for planning from pregnancy to delivery features more than 260 engaging and interactive prayers formatted with a daily topic, verse, devotional, and journal tip.